As with most dances, the exact origin of the waltz is a little murky. There are references to peasant folk dances that seem to be early forms of the waltz as far back as 13th century Germany, but these references are more prevalent in the 1500s. The waltz was originally viewed as a very scandalous dance since this was the first time dancers were seen holding in a close embrace. A man reaching his hand around a woman's waist in public was unheard of, but by the late 18th century, the 3/4 time waltz had become more mainstream and was finding its way into the more formal halls, ballrooms, and even the royal ballrooms. Since it was still viewed as an immoral dance, it of course, quickly grew in popularity and made its way over to the United States in the mid 1800s. 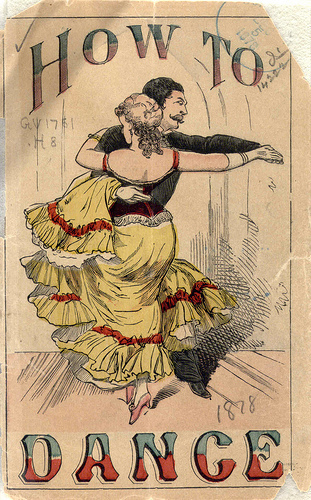 The dance slowly became more accepted, and by 1900, over three quarters of dance programs were just waltzes. The style of the waltz has changed through the years and has become a more relaxed version in later years. However, once the Foxtrot hit the scene around the time of World War I, the Waltz almost died out completely. It still managed to stay around, though, and popularity began to eventually rise again to carry the dance through today. Even though it is far from being viewed as a scandalous dance anymore, the waltz is still seen as an elegant and romantic dance. Characterized by a graceful rise and fall, the waltz sweeps around the room with smooth, elegant steps and rotating movements. It is still the highlight of many ballroom competitions in the smooth division. While some moves require you to stay in one spot, the waltz is classified as a traveling dance and generally flows around the floor. Waltz is typically the dance people think of when they hear the term "ballroom dance" and is still very popular at weddings and more formal events. There are variations in style between American and International waltz, as well as variations between regions.